I'm not really a collector, and I don't like to accumulate a lot of "stuff." But kitchen and dining things (oh, and books) are my one weakness. As if I needed any more of it, on a recent reconnaissance mission to a new thrift store in town, a couple of things jumped out at me and had to be purchased. Two lovely crystal goblets and four circa-1960 CorningWare (the original Cornflower pattern) 1 3/4-cup capacity Petite Pans. Of course, they were just screaming "Chicken Pot Pies," so I swung by the grocery store on my way home and picked up some organic chicken and vegetables. Turns out, the Petite Pans make the perfect size main-dish serving. I'm going to keep my eyes open, hoping to come across at least four more. I'll be using them next for my Shepherd's Pie or Vegetarian Shepherd's Pie. Once I find four or eight more of these or similar pans (like these 16-ounce round Corning French White), I can take advantage of the next chilly, stay-at-home kind of day, making a double or triple batch and freezing them. It's so nice to be able to pull a homemade comfort food meal out of the freezer on a day you can't, or don't want to, cook. What is your favorite cold-weather comfort food? Favorite vintage, or new, find? 2 Preheat oven to 400 degrees. In same skillet, melt butter and saute onion for 3 minutes, scraping up the brown bits from cooking the chicken. Add celery, bell pepper and carrots; saute for 2 minutes. Add mushrooms and 1/4 teaspoon of the salt; saute for 5 minutes. Stir in flour and cook for a minute or two. Gradually add broth, cream and sherry; cook, stirring constantly, until bubbly and thickened. Season with remaining salt and pepper. Remove from heat. Stir in the chicken and peas. (It's easy to forget about the peas because all the other vegetables went in at the beginning. But don't! The peas are wonderful.) Adjust seasoning. Divide mixture among four 14-ounce ramekins. 3 Roll out the pie crust to nearly 1/4-inch thick. Using your ramekin as a template, cut out 4 circles (or in my case, squares) about 1/2 inch greater in diameter than the ramekins. Top each ramekin with a circle (or square) of dough, fold excess under, press down the edges or crimp with a fork, and cut a 1-inch slit, or prick with fork, to vent. Place on foil-lined baking sheet. Bake for about 30 minutes. Let stand 5 minutes before serving. If you like, prepare ahead of time. Chill filling, assemble, cover pies and keep refrigerated until ready to bake. Preheat oven to 400 degrees 50 minutes before serving time. Put pies in oven 35 minutes before serving time. Let stand 5 minutes before serving. * I have the Cuisinart DLC-10E, which (understandably after all the years I've had it) is no longer available. Here is the Cuisinart Pro Classic DLC-10S, a similar current model. Note: This recipe is only slightly different than my smaller appetizer-size Chicken Pot Pies, for which the ingredients must be more finely diced. Oh Yum! I can't wait to make this pot pie. I've never made one before but I can just imagine how good it will taste. Since this looks like it takes a while to make, it might be good to make two and freeze one for a rainy day. I'm also thinking a cold beer might go with this one. Thanks for stretching my menu options in new directions! Thanks, Richard! If you double the recipe you could make one big pie in a 1.5- to 2-quart baking dish as well as the four individual pies. Oh, chicken pot pie is my one (of many) weakness. I wish I had thought of it for tonight's dinner. I always add some fresh italian parsley in my pie crust. Thanks for the inspiration. Thank you, Bonnie. I just love it when something stirs up wonderful memories! I like the idea of putting some fresh Italian parsley in the crust - I'll have to give that a try next time. Thanks for this delicious-looking recipe! Thanks, Judy. Yep, you counted right. But I'm like Dorcas Lane in Lark Rise to Candleford - I have lots of "one weakness"es! And let's not forget the pot pie.. YUM! I've become a fan of them as I have matured, I would have rather gone to my room than eaten a pot pie when I was a kid! I love that my tastes have changed over the years. Jenn, thank you. I even liked the frozen chicken pot pies when I was a kid. It was one of the few frozen foods in our house. Never liked the beef ones, though. They were nothing like my mother's good English beef pies. How fun that your mom had the cornflower pans - a real blast from the past! You know, I almost utter the classic (and some think, blasphemous) “What’s for dinner?” as I go to your column every Friday. I get the same rush of anticipation followed by a degree of gastronomic joy or petulant rejection same as if I were 10 years old (by Jing, I am 10 years old). Chicken pot pie is pretty much wasted on me, though I like to pick out the chicken and – counterintuitively for me – the peas and carrots. I also absolutely invariably inevitably inescapably…burn my tongue. I know of no better insulating material than chicken pot pie crust. Calderas of volcanoes are not as well sealed. Comfort food on a chill day? Allow me to insert “after a dehydrating workout.” Nothing better than cold, pure water…or OJ or apple juice, chilled – the Simply line of juices (no substitutes for them). Alissa, thank you! I hope you will try both. And DO let me know how they turned out for you! Ooh, I love a rainy day, Greg. Especially with pots of tea and a savory pie. Yummy, yum....what a wonderful dinner! One of my favorite comfort foods! Thanks, Laura! I didn't know you were gluten-free. I've developed several GF recipes; just check my Recipes/Reviews page. I love fresh or frozen peas, but I HATE canned peas (I'll have to tell about an "incident" with canned peas). 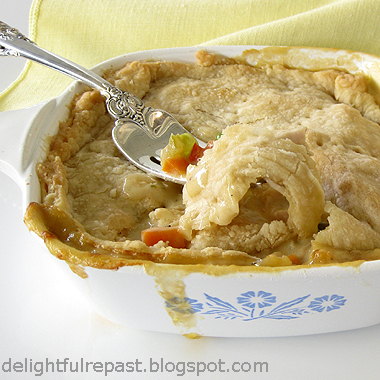 Chicken pot pie is one of the best things to eat on a cold winter day. Yours looks wonderful. Thanks, Lana! I'm always happy when it gets to be Comfort Food Weather. Marina, thank you. Of course, a teenage boy would probably want to eat two this size!